The Verine Marcello is a wall mounted high efficiency gas fire. The Marcello doesn’t require a chimney, just an outside wall through which the hot exhaust gases are vented away and the fresh air drawn in. This stunning contemporary Verine fire produces both radiant and convected heat and comes with a battery operated remote as standard, allowing maximum control of the fire from the comfort of the sofa or armchair. The Verine Marcello features a lava rock and loose ceramic stove fuel bed and dancing flame effect. The fire is then framed in a frame in graphic grey with optional stainless trim that really frames the fire and brings the flames out from the trim. 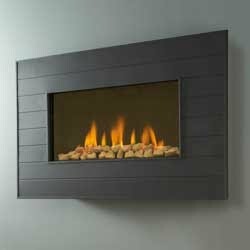 The fire is special in the way it can either be semi-recessed into the wall or completely hung on the wall for minimal building work. This powerful balanced flue gas fire gives out 4.2kW of heat energy and is 87% efficient and would make a stunning feature on any exterior wall. Esse Solo Traditional Electric Stove.